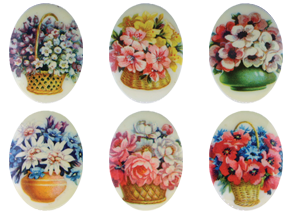 Porcelain paintings are flat decals on glass. #6994 25x18mm comes in 6 different scenes. Scenes may differ slightly from picture shown. Use as glue on or as a sew-on in a flatback setting. Made in Germany.